The revitalized Pearl building is a standard bearer for the idea of putting an old industrial space to new culinary and cultural use. Tex-Next is the name chef Johnny Hernandez gives to the cuisine he serves at Villa Rica. 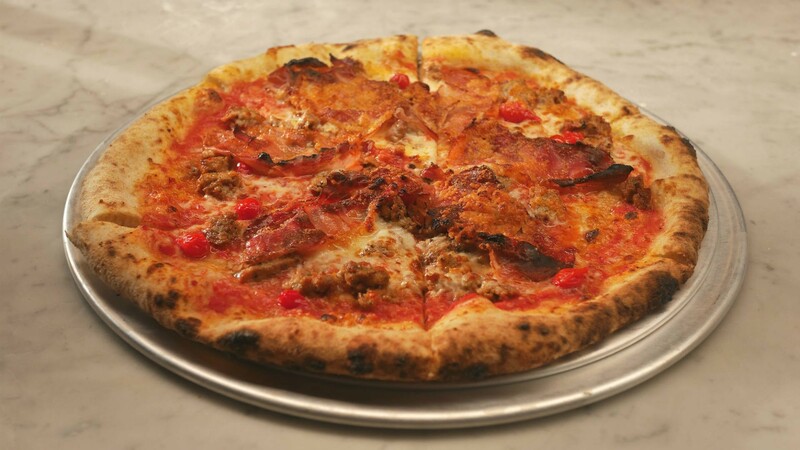 The Neapolitan-style pies from Dough represent their quality-over-quantity ethos. The Granary 'Cue & Brew's ales, saisons and stouts are brewed as a fitting accompaniment to chef Tim Rattray's modern barbecue. It’s my first dinner in San Antonio and the table is completely covered with small plates and dishes holding all manner of Mexican eats. Among them are a zingy ceviche, a crunchy tostada topped with lime-marinated shrimp, fish and octopus, fresh guacamole served with tortilla chips still warm from the fryer and ‘rice tumbada’ – an incredibly flavourful seafood stew that’s the least visually appealing dish in the spread but definitely the most delicious (the anti-Instagrammer in me relishes this feat). It’s a scene that could easily pass for Toronto’s hippest taco joint (with tattooed and bearded waitstaff just out of the frame). But here in San Antonio, a mere two-and-a-half-hour drive from the Mexican border, tacos and Tex-Mex are a way of life. Kids grow up eating these hand-held eats and Mexican-Americans have been operating their own cheap and cheerful taquerias for decades, appealing to the blue-collar demographic that has long dominated the city. But at one of San Antonio’s newest eateries, rethinking Tex-Mex favourites brings this cuisine back to its roots. Villa Rica, which is temporarily closed for a space and menu redesign, swaps tortilla and tostada shells for fresh-made varieties. Corn flour is incredibly perishable, requiring preservatives or bleach to extend its shelf life. But Villa Rica’s are preservative-free and freshly-pressed from non-GMO corn flour, some of which is milled from organic corn grown on a nearby farm owned by the restaurant’s founder, chef Johnny Hernandez. These tortillas are noticeably more pliable and soft compared to their processed equivalents. 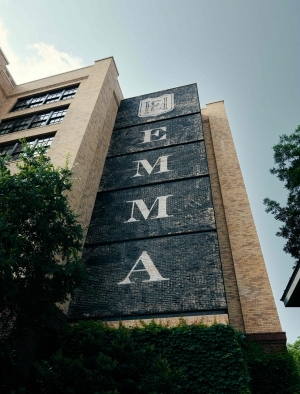 The Hotel Emma has turned a former brewery into a cultural centrepiece. 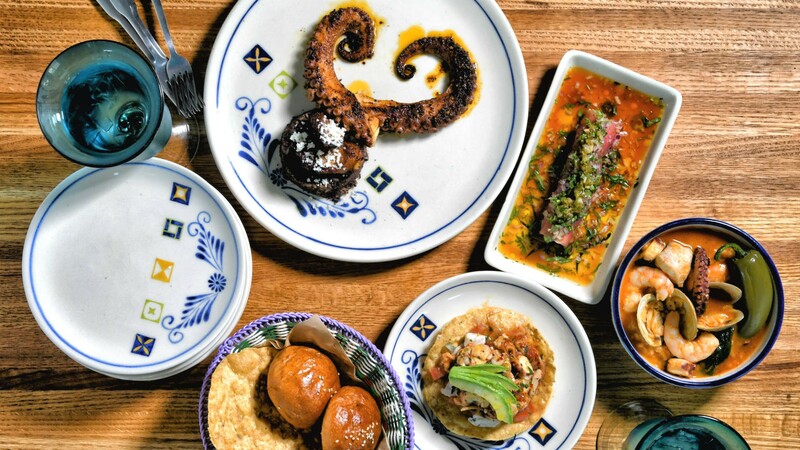 Hernandez affectionately refers to his style of dining as “Tex-Next” — an evolution of Tex-Mex that sees more thought and care put into the preparation of Mexican cuisine. His pulpo is poached in aromatics overnight so that it’s incredibly tender and flavourful before being finished off on a grill prior to serving. Even the decor at Villa Rica pulls from Mexican tradition – its colourful woven napkins and decorative ceramic dishes are sourced directly from Mexican artisans. This food is homey and good, putting it levels above those cheap and cheerful Tex-Mex joints without being so stuffy and refined that it sails over the average San Antonian’s head. The attention to detail does, however, come with a higher price tag. Some may scoff at Villa Rica’s US$13.50 seafood tostada or $26 fish entree which bring these meals outside of the realm of everyday dining. But I don’t have to ask whether locals are willing to pay more for the evolution of a cuisine they’ve grown accustomed to getting for less. Villa Rica is Hernandez’s fourth concept and tenth eatery since opening his first restaurant, the Mexican street food-inspired La Gloria, in 2010. It’s proof that there’s an appetite for Hernandez’s brand of elevated “Tex-Next” dining. La Gloria did have some help from its surroundings. That first Hernandez restaurant is located at the Pearl – a 22-acre former brewery that is San Antonio’s best example of a repolished pedestrian classic. The facility, which opened in 1883, was once the Texas headquarters of Pabst but they closed in 2001. After extensive renovations, the first new tenants moved in and opened in 2006 to begin the Pearl’s transformation into a culinary, arts and housing hub. 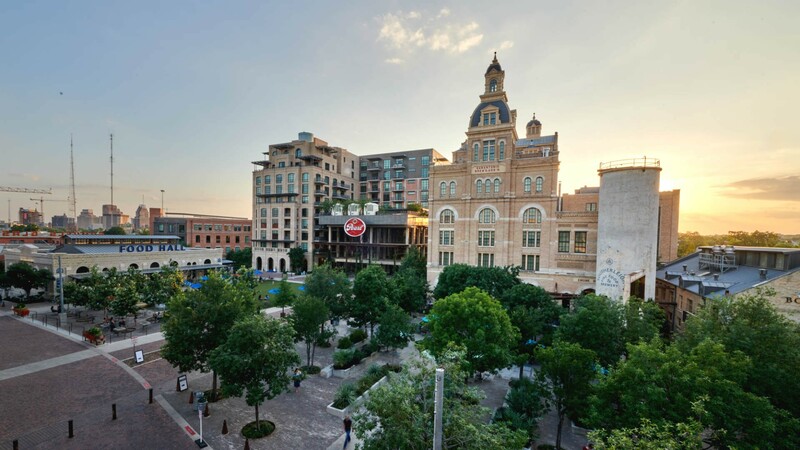 It’s now home to the Texas campus of the Culinary Institute of America, condo complexes, an event venue, food hall, boutiques, bakeries and the list goes on. My favourite adaptive reuse in the complex is in the former brewery’s administrative building. It now houses Cured, a charcuterie restaurant that cutely stores its wine in a centuries-old safe at the centre of the building. The undoubted cultural highlight of the complex (or at least the most photographed by tourists) is Hotel Emma, a slick Drake-Hotel-like property that opened four years ago. Housed in the actual former brewhouse of the Pearl, the building design and aesthetic pay homage to its former use at every turn: an ancient ammonia compressor is the lobby centrepiece and old fermentation tanks have been sliced open to create cozy booth-like seating at Sternewirth, the hotel bar. Photo-worthy scenes aside, the Pearl really comes to life on the weekends when a farmers’ market takes over the central lawn of the complex. Farmers, apiarists, natural and beauty product-makers congregate over good food and drink. Patrons, locals and tourists alike, represent all ages, from toddlers shrieking delightedly in the outdoor water play feature to older folks browsing the kombucha selection. On the Saturday morning when I visit, a five-piece bluegrass band entertains the market crowds. Mothers are pushing strollers in one hand and holding plates of chana masala or tomato-and-bacon beignets in the other. It’s an animated, buzzing atmosphere that clearly draws repeat visits. Beer is still brewed at the Pearl, albeit in much smaller quantities. On the second floor of Southerleigh, a hip restaurant serving modern takes on Southern classics, an on-site brewery produces craft pours for both the eatery and its bottle shop. Wooden barrels are stacked along a hallway leading to the bathroom with signs indicating the brew that’s aging inside while lengths of vintage rolling conveyor belts act as apt decor above the chef’s table overlooking the kitchen. And at the Granary ‘Cue & Brew, whose name cutely reveals its purpose, ales, saisons and stouts are brewed as a fitting accompaniment to chef Tim Rattray’s modern barbecue. The Granary’s lunch menu steers closer to traditional Texan classics with meat by the 1/2 pound (served light on the sauce, following the state’s typical style of barbecue), sandwiches and sides so that diners can make their own barbecue board. Barbecue, I’m told, is a very personal affair with deep working-class roots in the South. A Texan I met told me her brother has three smokers in his backyard. This is what makes Rattray’s dinner menu especially daring. Here he flexes the culinary muscles he built in French fine dining kitchens in San Antonio and New York. House-baked loaves of buttermilk bread are sliced and grilled over rendered beef fat collected from the restaurant’s smoker to gain a French toast-like quality. 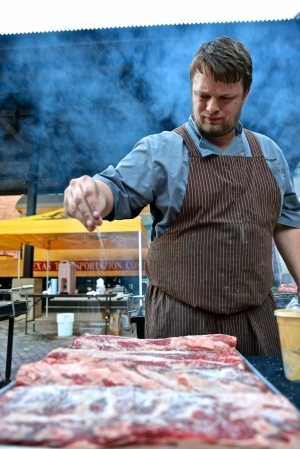 Brisket drippings – another smoker byproduct – is whipped to create a ‘barbecue butter’ that’s neatly quenelled and served alongside the slices of Texas toast. This polished execution and refined presentation of simple, good and rustic ingredients is how Rattray has made a name for himself as the man who is breaking all the traditional rules. Pickled chanterelles accompany pastrami made from meat shaved off of a hog’s head. The salt cod fritter, Rattray’s self-professed “ode to the South,” is dipped in a dijonnaise made with house-brewed red ale and topped with pretty nasturtium flower petals. All the meat he sources is ethically raised and thoughtfully selected – for example, a heritage breed of pork that has plenty of intermuscular fat but isn’t too “porky”. Rattray’s elevated take on classic barbecue hasn’t gone unnoticed. The eatery has gained international attention by hosting special collaborative dinners with Michelin-starred chefs like Copenhagen’s Bo Bech and Julio Fernandez from Seville. 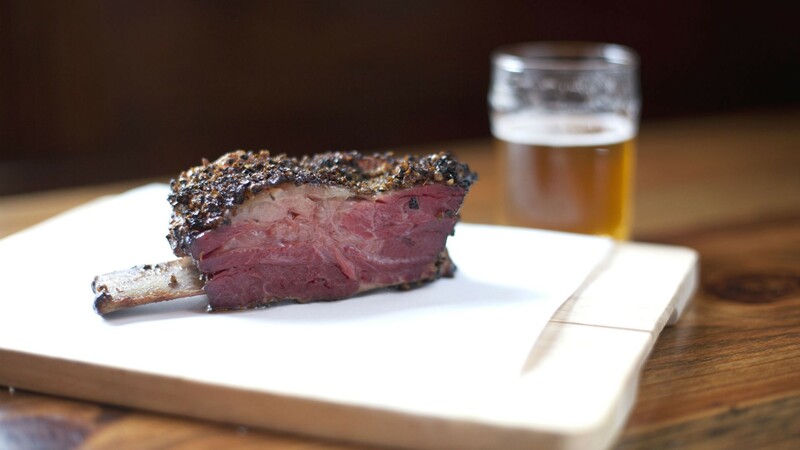 Closer to home, the Granary has ranked in countless “best barbecue” lists from OpenTable, Texas Monthly and Condé Nast Traveler. Each accolade draws in a wave of new customers eager for a taste of one of the state’s, and country’s, best. But are the locals – largely the same working-class individuals who hold barbecue deep in their hearts – ready to embrace Rattray’s refined takes? While dining here on a Saturday evening among families, couples and groups, the restaurant’s $18 barbecue board – its most traditional menu option – is the entree of choice for nearly every guest I encounter during my two-hour meal. You can make an incredible modern barbecue experience but whether your patrons choose to order it is another question. I got to try some of Rattray’s most innovative creations and it’s a shame that they are being overlooked by the majority – a tide I am confident will turn as more guests from near and far grow to better appreciate Rattray’s more creative offerings. The owners of Dough, a Neapolitan pizzeria that opened its first location in 2007 and recently expanded this year with a third spot downtown, are riding a similar wave of culinary evolution in San Antonio. Here, thin-crust pies are baked in a wood-burning oven imported from Italy and accompanied by sides like fresh-made burrata and speck sliced from a beautiful hand-cranked slicer. These offerings are a far cry from the $10 extra-large takeout specials from the Papa Johns that dominate the city. Co-owner Lori Horn, who runs the operation alongside her husband Doug, knows that the customer base in San Antonio isn’t easily swayed by the prospect of artisanal pizza. The Horns train their front-of-house staff to be extra attentive, doting on each guest in a way that Lori says locals aren’t accustomed too. If her customers aren’t charmed by the service, the sleek signage, design and branding might do the trick. It’s logo – a pizza base captured midair – mimics the infinity symbol and appears again in the restaurant’s tagline: Pizza Forever. She’s meticulous with the restaurant’s growth and improvement, offering comment cards for diners to complete after their meal. The Horns have put their money on the same bet as Rattray’s modern barbecue and Hernandez’s homestyle Mexican: that the people of San Antonio – a city with strong working-class roots – is ready for a dining revolution. The chefs, restaurants and their menus are waiting at the barricades. All it takes is more adventurous taste buds, willing to eat off the beaten path, to rise up.